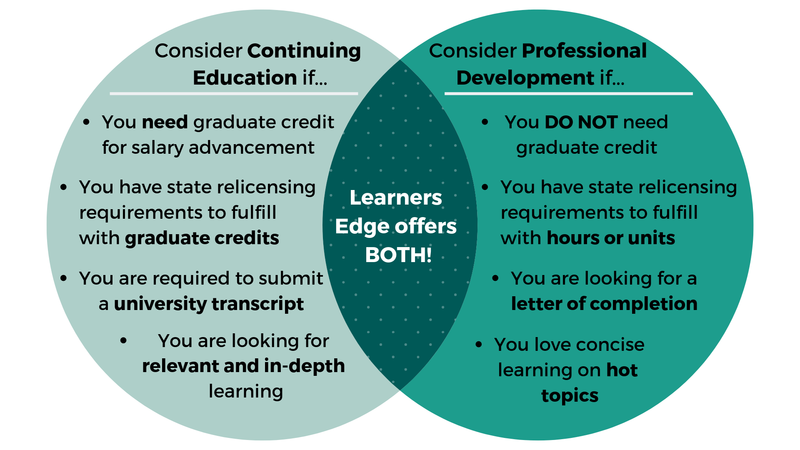 Below is a summary of how Learners Edge may help in renewing of your California Teaching Credentials. This summary should in no way release individuals from their responsibility of ensuring that the course they take meets their professional needs. We hope it provides assistance in understanding how Learners Edge might help you in the salary advancement and relicensure process. For complete official relicensure information, including forms, visit the California Department of Education. CLEAR teaching or services credentials may be renewed without the completion of additional course work or service requirements. See Coded Correspondence 06-0017. All clear teaching and services credentials must be renewed online. See Coded Correspondence 06-0011. Regulations require that the issuance date of the clear credential be the same as the expiration date of your current credential, provided that the renewal application is filed within one year prior to the expiration date of the credential. Lapsed clear Ryan or Pre-Ryan credentials may be reissued effective the date an application is filed. No California public school service is authorized between the date the credential expired and the date the reissued credential becomes effective unless a “Request for Validation of Service Without a Credential” is filed by the employer. Reissued general credentials, standard credentials, and Ryan credentials expire five calendar years following the issuance date. DEPENDENT clear credentials are normally issued for five years but by statute cannot have an expiration date that exceeds the expiration date of the prerequisite credential. If the prerequisite credential is not valid for a full five years at the time an individual applies for the dependent credential, the dependent credential will be issued with the same expiration date as the current prerequisite credential. FIVE-YEAR PRELIMINARY OR LEVEL I teaching credentials cannot be renewed. To continue to teach in the public schools of California, you must complete all of the requirements for either the clear or Level II credential before the expiration date of your preliminary or Level I credential. If you are teaching when the credential expires, contact your employer about the possibility of acquiring an extension by appeal to cover your service until you can complete the requirements. Complete a baccalaureate or higher degree, except in professional education, from a regionally accredited college or university. Satisfy the basic skills requirement. See Commission leaflet CL-667, entitled Basic Skills Requirement for additional information. Achieve a passing score on the appropriate subject-matter examination(s). Information, including passing scores and registration, can be found in Commission leaflet CL-674S entitled Verifying Subject-Matter Competence by Examination for Single Subject Teaching Credentials. Complete a Commission-approved subject-matter program or its equivalent and obtain verification of completion from the authorized person in the education department of a California college or university with an approved program. Satisfy the Developing English Language Skills, including Reading requirement by completing a comprehensive reading instruction course that includes the following: the systematic study of phonemic awareness, phonics, and decoding; literature, language and comprehension; and diagnostic and early intervention techniques. Explore Learners Edge Literacy courses. Complete a course (two semester units or three quarter units) in the provisions and principles of the U.S. Constitution or pass an examination given by a regionally-accredited college or university. Complete foundational computer technology course work that includes general and specialized skills in the use of computers in educational settings. Explore Learners Edge Technology courses.